Adrienne has had a 3D capable LED for years now, and I finally cajoled her into getting an emitter and glasses for it. I've got a stack of a dozen and a half 3D movies just waiting for me to find time to watch them all. I tackled Creature first because I've wanted to see it in it's original form for so long. Well, now I've seen it, and I'm disappointed. Don't misunderstand me, it looked absolutely gorgeous. 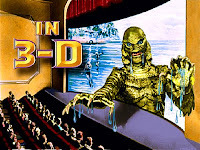 It was the remastered 3D Blu Ray included in the Universal Classic Monsters Essential Collection, and I can't imagine that a movie of this vintage could possibly have looked better. It was the 3D that disappointed. The 3D was well rendered with no ghosting and very little crosstalk. It added an incredible amount of depth to the picture. It avoided the "cut out" look one often sees in lesser 3D efforts like many of the post production conversions. The problem, then? Nothing ever came at me. Not once. The creature's hands, the spear gun, the bow of the boat - clearly, they were all intended to jut out from the screen to give me a cheap thrill. They didn't. I'd waited all my life for the creature to be coming at me, and he never left the confines of his 3D television aquarium. The way it was supposed to be . 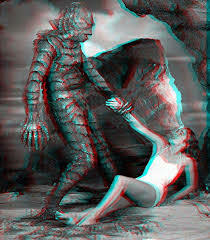 . .
You see, apparently it's tacky to want your 3D in your lap. If it's in your lap, it is a gimmick, and James Cameron and his acolytes want to convince you it's not a gimmick. Well dammit, I want the gimmick. 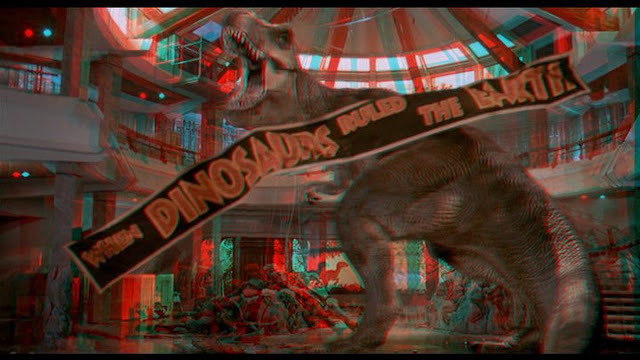 The 3D in Creature was supposed to pop out of the screen. It didn't, and I feel cheated. I guess I'm the poster boy for the unwashed masses who believe 3D isn't 3D unless the guy sitting in front of you gets slapped in the back of the head a few times. Shouldn't the 3D be presented in the fashion that best approximates the filmmaker's intent, though? 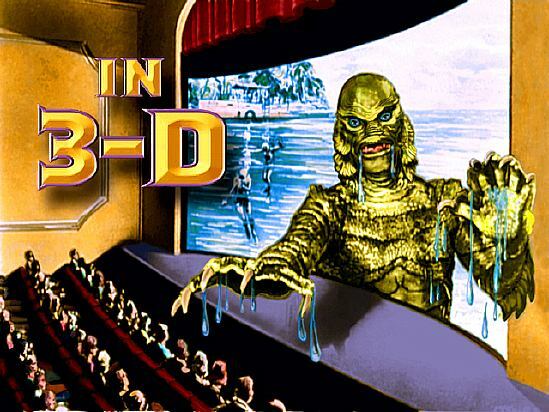 The 1950s era 3D was all gimmick. It was big-screen cinematic sleight of hand intended to put asses back in the seats when too many of those asses ended up on their couches in front of the television. Where's the showmanship? All the restoration crew had to do was set the parallax accordingly, and I could have had a lap full of creature - or even better, a lap full of Julie Adams. Instead, I get a perfectly executed sense of depth with no pizazz. Oh, the humanity. Whatever else one might say of the 2009 My Bloody Valentine remake, the 3D gags delivered the goods. I was fortunate enough to see it in a packed theater on opening night, and the audience loved it. We had a pickaxe thrown at us within the first fifteen minutes. I had an eyeball pop out at me just like the gag everyone remembers from Friday The 13th Part III (1982) in 3D. I had the top half of a victim's head slide down a shovel seemingly within inches of my face. And of course, let's not forget actress Betsy Rue fleeing from the killer buck naked in three dimensions. Director Patrick Lussier knew how to work that 3D gimmick for everything it was worth, and it was glorious. I realize there's a place for the more subtle three dimensional depth, but most of the movies I've seen that take a more subdued approach leave me wondering what, if anything, the 3D really added. Occasionally I'll see an example that makes me think otherwise, and I'm going to pointedly avoid offering up Avatar (2009) since that seems to be everyone's go-to high water mark. 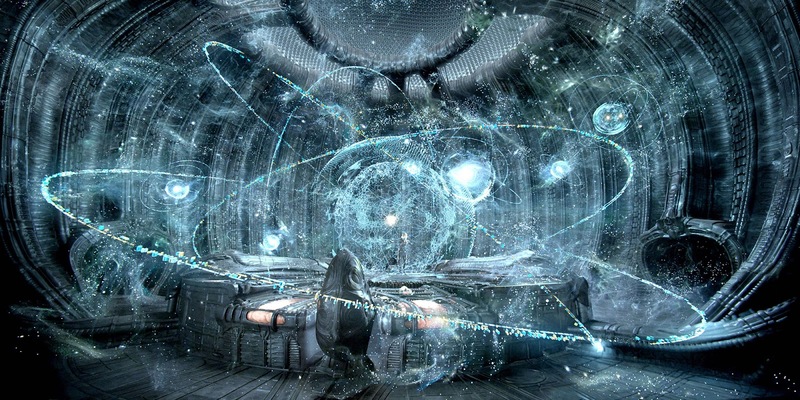 The most effective more subtle use of 3D I've seen would have to be Prometheus (2012). Even that movie's most vocal critics have generally acknowledged that it was beautiful to look at, and the 3D did an exemplary job of drawing the viewer into the meticulously rendered alien environments without calling undue attention to itself. Fine. But how many one hundred and thirty million dollar sci-fi movies do you see? I suppose what it boils down to is that I have different expectations depending on the nature of the project. I fully expect The Final Destination (2009), Final Destination 5 (2011), Resident Evil: Afterlife (2010), Resident Evil: Retribution (2012), and Hansel & Gretel: Witch Hunters (2013) to be throwing the gimmicky projectiles off the screen at me hot and heavy. I'm willing to temper my expectations and expect something more subtle when I watch The Amazing Spider-Man (2012), Oz The Great And Powerful (2013), Hugo (2011), and Coraline (2009). I'm not sure what to expect when I watch the 3D conversion of Jurassic Park (1993), but I'm pretty excited about it. I hope objects in mirror are closer than the appear, or that they at least appear closer than they appear.